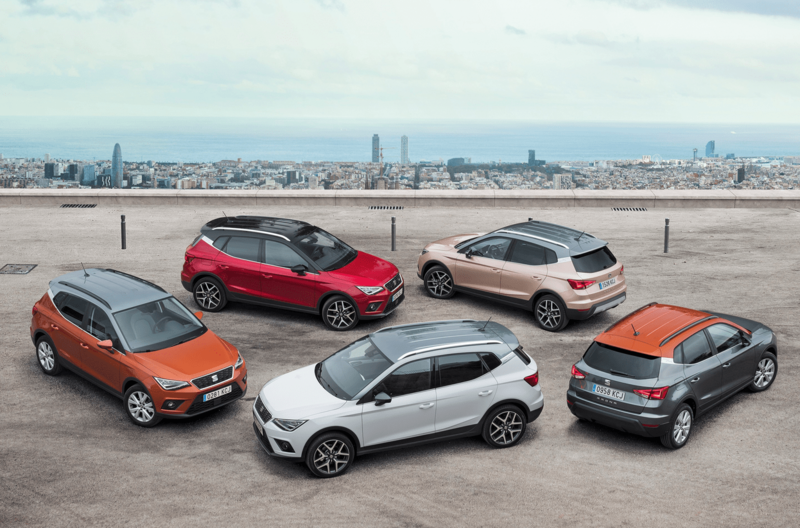 The eagerly anticipated all-new SEAT Arona crossover has been unveiled at the international launch in Barcelona recently. The all-new SEAT Arona is the brand’s third new model release in 2017, after the upgraded Leon and the all-new Ibiza. This is yet another addition to the SEAT range in its biggest product offensive ever, which also includes the Ateca SUV and the upcoming large 7 seater size SUV that will be released in late 2018. The all-new SEAT Arona sits neatly within the SUV range as the younger brother to the Ateca in the SEAT family yet has all of the driving assistance and infotainment systems you would expect, such as Front Assist, Adaptive Cruise Control, Hill Hold control, Fatigue Detection, Rain and Headlight Sensors and Multi-Collision Brake. Keyless Entry and Start System, precise and high-quality rear camera, premium 8″ black panel touchscreen, wireless charger with GSM signal amplifier are also available as part of SEAT’s commitment to delivering the very best technology. Rear Traffic Alert, Blind Spot Detection and Park Assistance System, which works for both parallel and angle parking, are all included in the impressive offering. In terms of connectivity, Arona features Apple Car Play, Android Auto and Mirror Link. In the sound department, the all-new SEAT Arona features optional BeatsAudio with 6 premium speakers, a 300W 8-channel amplifier and a subwoofer in the boot. Like the Leon, Ateca and Ibiza, the all-new SEAT Arona offers S, SE, FR & XCELLENCE trims. The dual-coloured (red and white) ambient indoor LED light and dual-zone climate control with an aircare filter are also available on the all-new Arona, while at the front of the car, the triangular headlights with its attractive colour and excellent luminance make the Arona instantly recognisable. The FR trim includes optional dual-mode suspension, and the SEAT Drive Profile with four modes: Normal, Sport, Eco and Individual. To simplify the process of outfitting the new SEAT Arona, the optional equipment is grouped into packages. Strength nowadays lies in efficiency and reliability. All of the engines available in the all-new SEAT Arona range have direct injection, a Turbocharger, and feature an automatic stop & start system. There are three different petrol engines to choose from, all with an aluminium block. The first is the 3-cylinder, 95 PS 1.0 TSI, which is linked to a five-speed manual gearbox. Also available is this same engine but in a 115 PS version, which comes with a six-speed manual gearbox or the dual-clutch seven-speed DSG transmission. The third is the new four-cylinder, 150 PS TSI with active cylinder disconnection technology, which is exclusive to the FR trim and is connected to a six-speed manual gearbox. As for diesel options, the efficient and reliable 1.6 TDI will be available with 95 and 115 PS. The 95 PS version can be paired with a five-speed manual transmission or the seven-speed DSG, and the 115 PS with a six-speed gearbox. Niall Phillips, Brand Director at SEAT Ireland commented, “Here at SEAT Ireland and across our dealer network, we are excited to bring the Arona to Ireland in November. Our SUV range is proving to be extremely popular, and the Arona is the perfect complement to its larger brother the Ateca which is continuing to generate a phenomenal reaction from Irish drivers”. As it enters the fastest growing segment in Ireland, prices for the entry level S model of the Arona crossover range start at just €17,995. The international launch of the SEAT Arona comes shortly after SEAT Ireland revealed details of its phenomenal 181 offers which will be available across its 23-strong dealer network until November 20th. To celebrate the launch of the all-new Arona, during SEAT’s 181 campaign, PCP finance is available at only 2.9%. This attractive incentive also included a scrappage offer of €1,000 while a three-year service plan is available for just €199. The all-new SEAT Arona will arrive in Ireland in late November. To find out more visit www.seat.ie.